Let’s take a look into the wonderful world of webcomics. You might have noticed that in the previous recommendation, one of the suggestions was a webcomic. It was on purpose. I didn’t send you to a secret, hidey-hole, pirated version of a comic. Webcomics are usually written and drawn by a single — or small group of — artists, who post pages online in increments of their choosing. 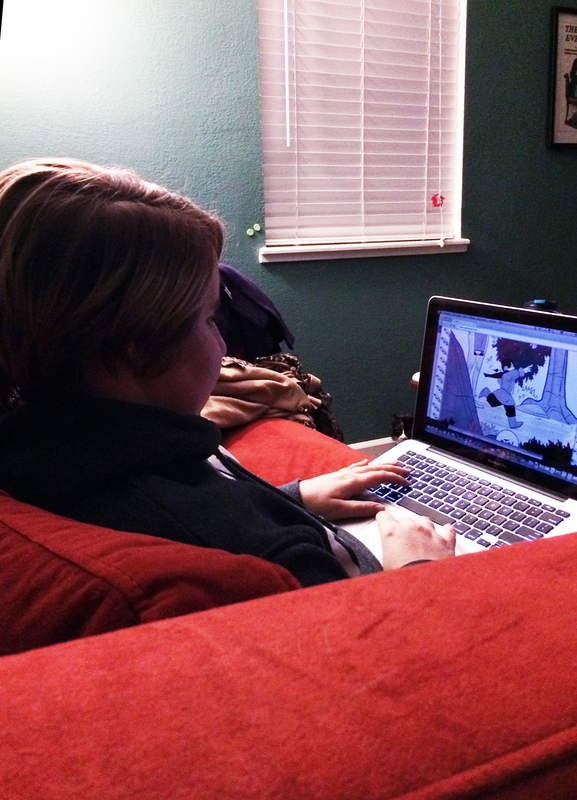 Student Jillian Ray settles in to read the webcomic, Oyku. Photos by Michelle Zaludek. They offer a free — yes free — alternative to traditional comics that allow the artist full creative reign. “You’re also able to be more flexible with the format of your comic, and you can do some interesting things by experimenting with the presentation of your comic,” said Erin Burt, creator of webcomics Metacarpolis, Four Tales and Work in Progress. “As far as what I choose to work on, it mostly has to do with what I think I can accomplish artistically and how it’s going to take, along with whatever story is the most interesting for me to write at the moment,” Burt said. They can be a little harder to find though. There’s no local shop to offer help. Often they’re found by word-of-mouth — well, word-of-Web — through friends or online recommendations. A long day ends in a relatively easy night for Ray. Webcomics are “easy to access, easy to read, [with a] wide variety of topics and formats,” Sam Hamill, a student and webcomic reader, said. As for the artists, “the main advantages of the digital format are the relative ease of getting your ideas out there, though you still have to find your audience. It’s simply easier and cheaper to make your comic available,” Burt said. “They can just be really hard to follow up on depending on how often they update and there’s always that whole, ‘Oh but I like having a physical copy — just to own,’ mindset,” Gomez said. “From a business side, you have to learn different methods of monetizing your comic if you want to earn income from it, and it can be harder to get respect in the professional comics world when not coming out of the print industry,” Burt said. So they’re different, that’s for sure. But webcomics can offer a viable source to getting your comic fix if you’re willing to look for them.